Difference between revisions of "RizonBNC FAQ"
# You must have a registered nick for at least 7 days. # Connect to the network using a [[TLS|secure connection]]. * Replace <code>PORT</code> with either <code>1234</code> for non-SSL, or <code>+12345</code> for SSL. * Replace <code>USER</code> with your username. * Replace <code>BNCPASSWORD</code> with your BNC password. 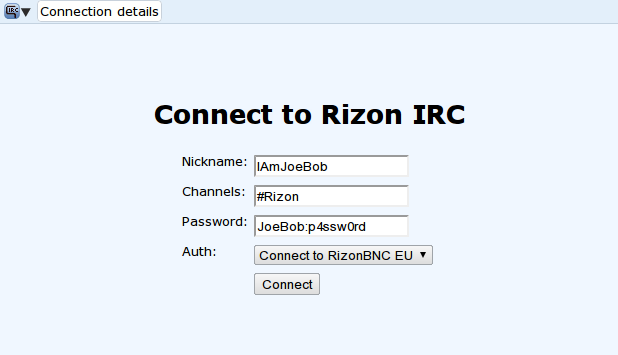 # Enter your nick and select either "RizonBNC US" or "RizonBNC EU" from list. # Click on 'Server' and 'Auth'. # Enter <code>rizonbnc.us.rizon.net:1234</code> into the 'Server address' field. # Enter <code>rizonbnc.us.rizon.net:+12345</code> into the 'Server address' field. # Change the dropdown from 'NickServ' to 'Pass'. 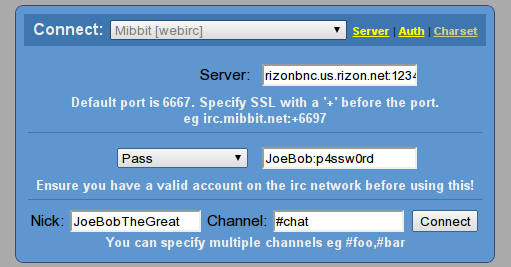 # Enter your RizonBNC password in the format <code>user:pass</code>. # You won't need to change the nick, and you can leave the channel parameter out. Hit Enter. For SSL: Change step 3 to <code>rizonbnc.us.rizon.net:+12345</code> as the address. If you don't know what SSL is, then use the normal address. For EU BNC: Change step 3 to <code>rizonbnc.eu.rizon.net:+12345</code> as the address. # Change the 'Nickname' field to your desired BNC nick. If you do not modify this setting it will change to that nickname as soon as you connect to your BNC. # In the text bar below, type <code>/server rizonbnc.us.rizon.net:1234 user:pass</code>, and hit Enter. # In the text bar below, type <code>/sslserver rizonbnc.us.rizon.net:12345 user:pass</code>, and hit Enter. For SSL: Change step 4 to <code>/sslserver rizonbnc.us.rizon.net:12345 user:pass</code>.